We have your " Hut " For Less !!! Glass to glass corners can maximize your work area to its full potential. The glass to glass corners with polished edges are sealed with clear silicone for water tightness. The standard booth solves project headaches. 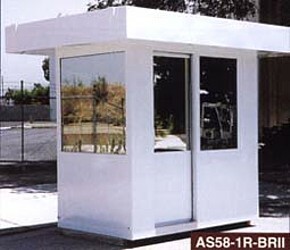 Our standard booth is offered in two different sizes to fit the typical location. 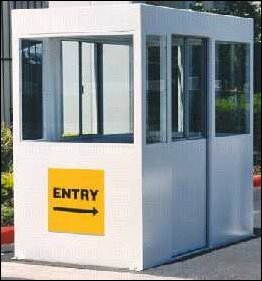 They are designed to provide protection from the changing environment and to offer security to your facility. 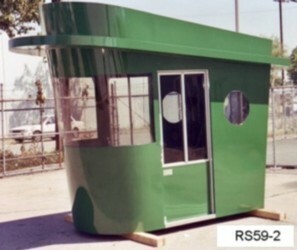 These picture can give you some idea of the variations in guard huts. You can cut and paste the following questions into your email and simply answer them before emailing them to us. In order to get you a price quote please Cut and Paste the following into your your email : answer these questions? 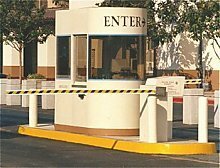 Corporate Security, Warehouse, Federal Agency, ETC. Do You need Locks to Secure the Door? Do You Need Special Glass, Wire Glass Bullet Resistant glass, wire glass etc ? 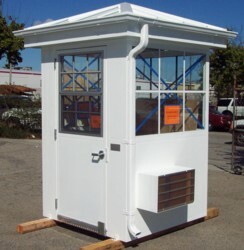 Do You Need a Teller Window Build In To the Hut with deal tray speak thru etc? Will You Require a package Receiver to pass large packages ? How many hours will the booth be manned ? Do you need A/C and Heat? Do You need external and internal power Outlets how many ? Do you need Tinted Windows? Do You need a Shelf or Desk 12 or 18 inches approx ? 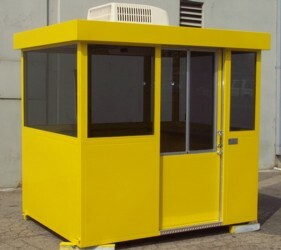 Do you have a specific size of booth 4 x 6 5 x 7 etc in mind ? Do you need a Light inside or Outside ? Do you need a portable unit ? What will you be mounting It on, asphalt, dirt, concrete etc. What finish or color or custom painted do your require ? What is your Budget approx $ amount ? Include your address including Zip Code for freight quote Purposes ? What kind of time frame to you have for the purchase of this unit ?